Driver is from Intl-outdoor.com, but it looks like it has been removed from his shop. 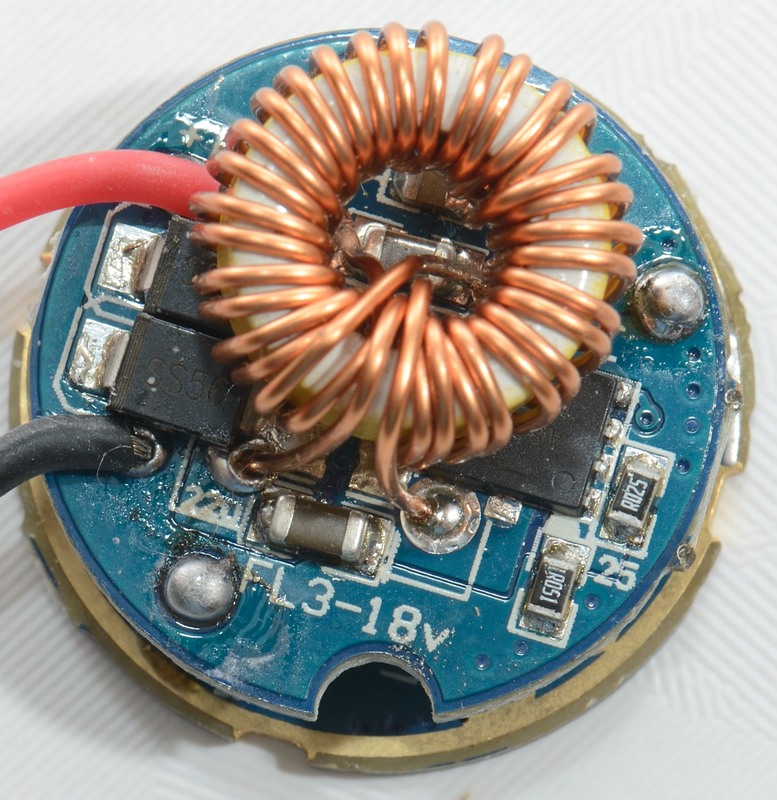 Does turn off after about 3 minutes with low voltage warning. 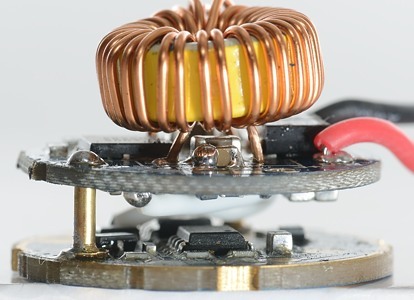 Uses a 25kHz regulation frequency when turning down output due to heat. The driver can be used with 2, 3 or 4 LiIon batteries in series. 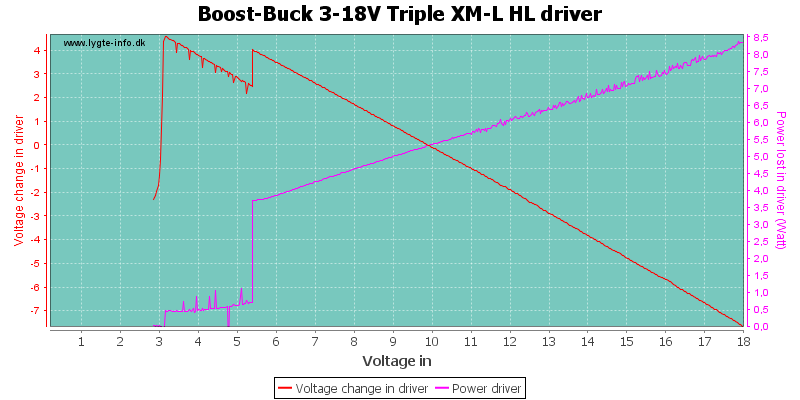 Driver can both do buck and boost. The low voltage warning only works with 2 batteries, not with 3 or 4 batteries. 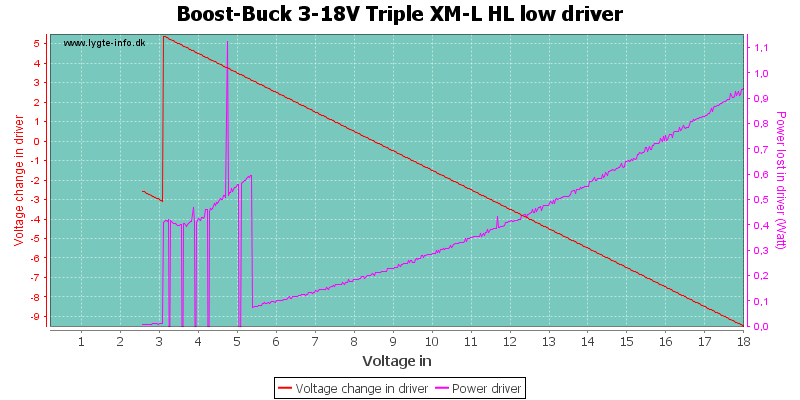 This driver does not use a constant current to drive the led, but varies the current, depending on the battery voltage. 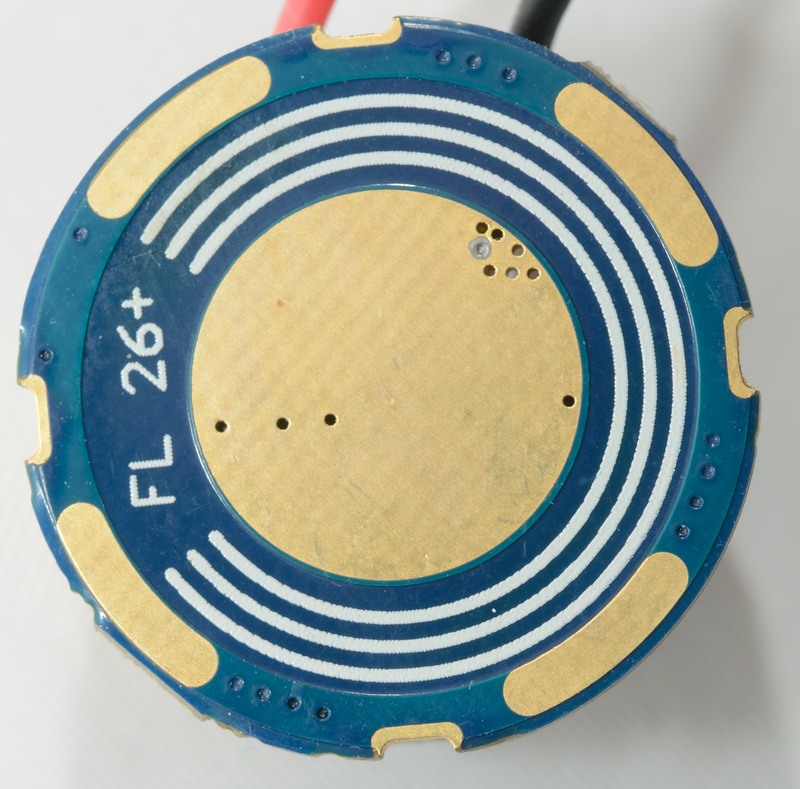 At 5.5 volt it reduces the led current and shows a battery warning. 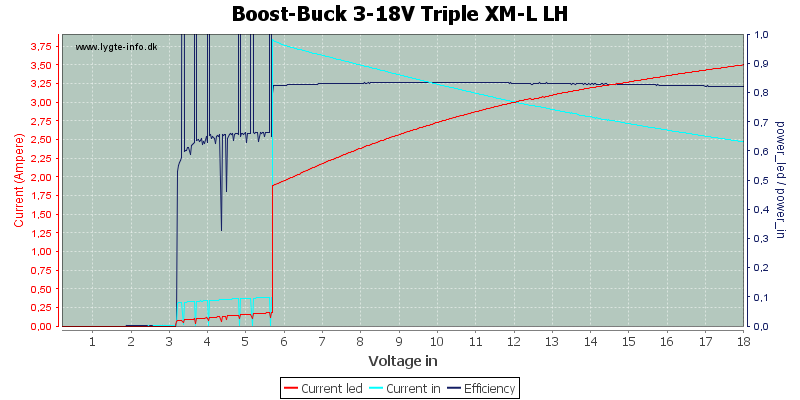 The driver changes seamless between buck and boost. Because the current is varies, the led voltage will also vary. Doing a sweep from low to high voltage, shows that the low battery warning will be turned off when the battery voltage raises. 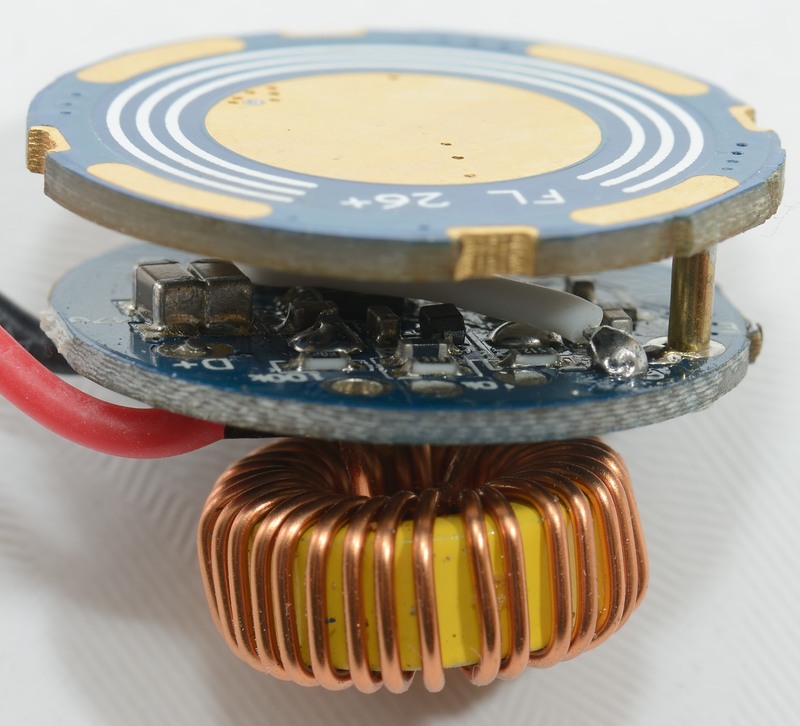 At high the led is fed with a fairly constant current. If the driver gets hot, the current is reduced, the regulation is done at 25kHz, i.e. no visible flashing. The low battery warning is two flashes with about 6 seconds between. 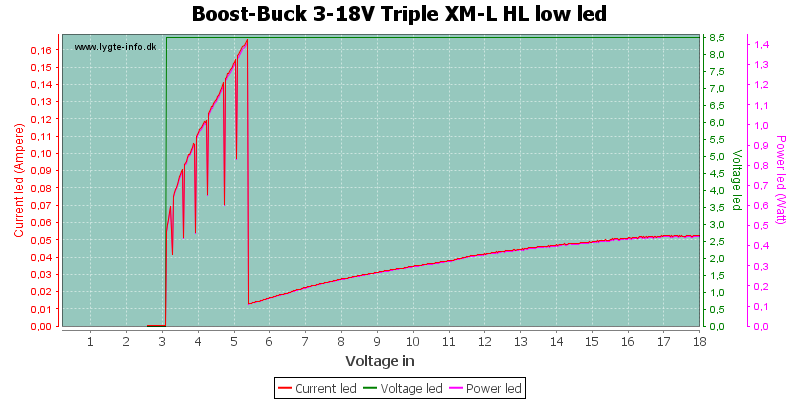 Because the light uses pwm, I am cheating a bit to calculate power: I have locked the led voltage to a constant value. 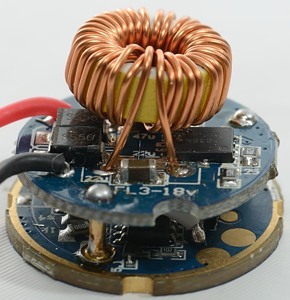 The driver is pulsing the current at a fast rate and it is no surprice that it looks like high. 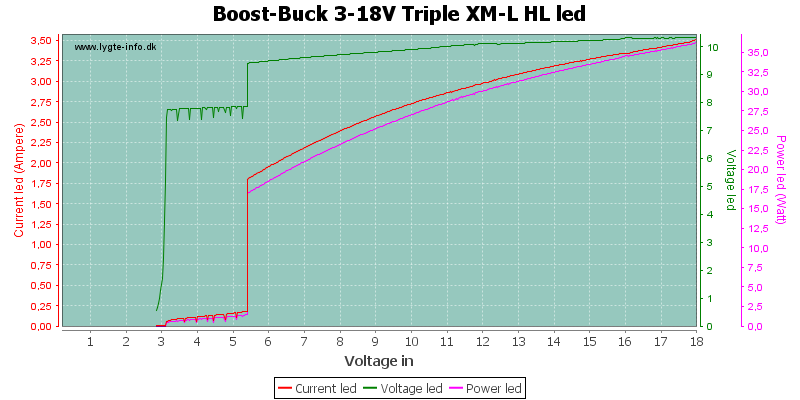 Notice the fixed led voltage, this is a cheat, not a measurement. 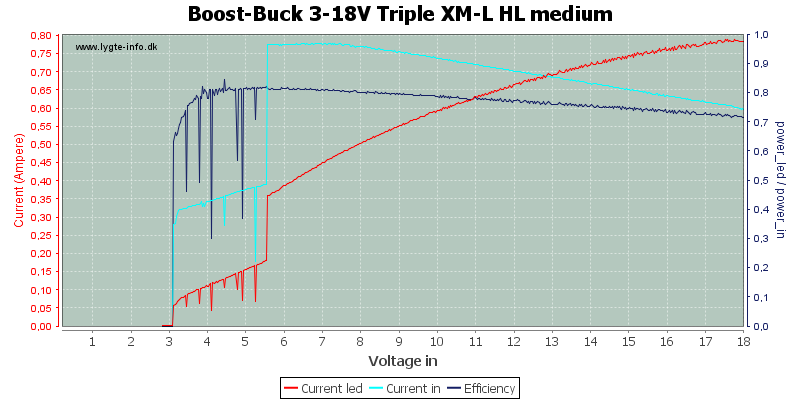 The correct voltage would be closer to the curev from high. 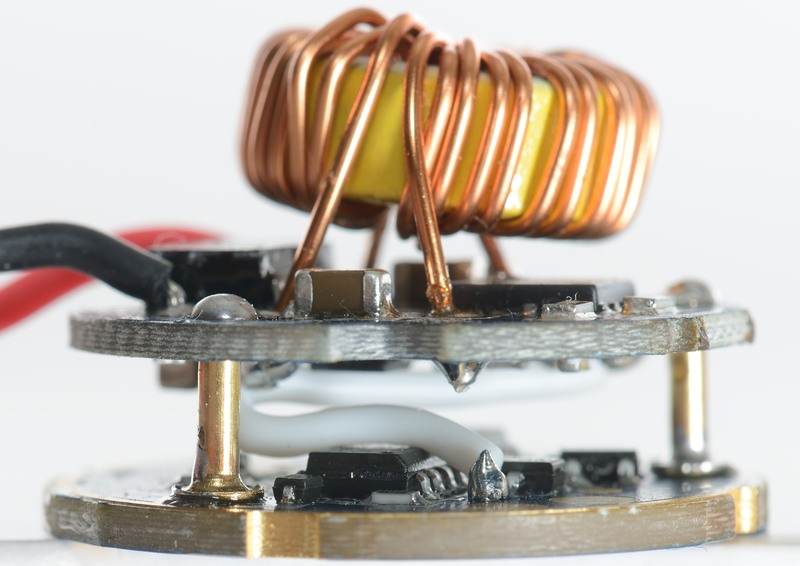 The pwm can easily be seen on the curves, but are to fast to see with the eyes. The low level is low and the battery warning uses a higher level. 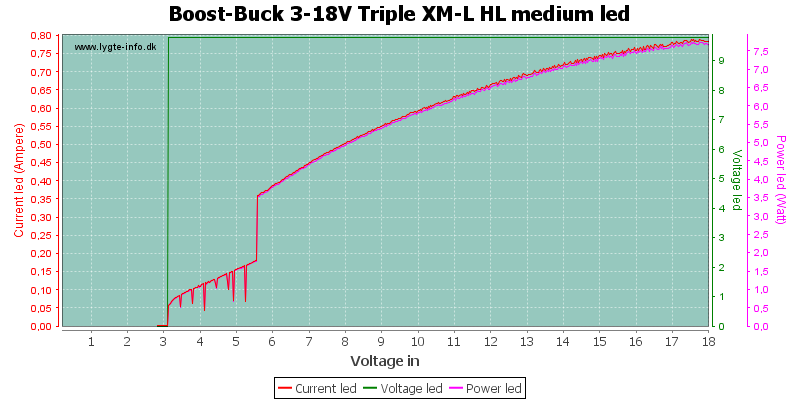 Again I have used a fixed led voltage. 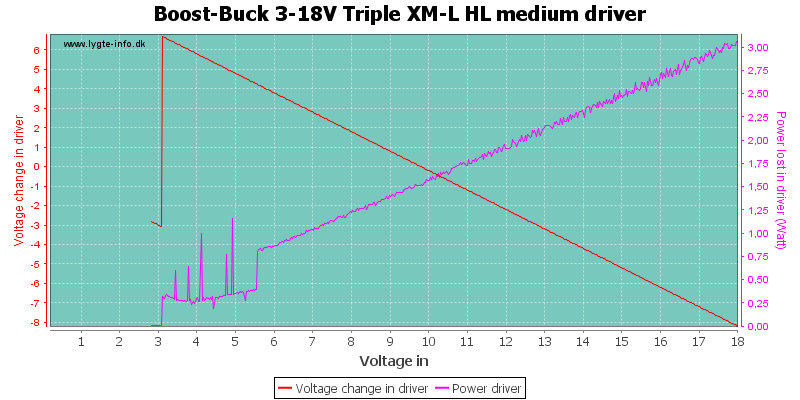 The driver is using a very short duty cycle for low mode. 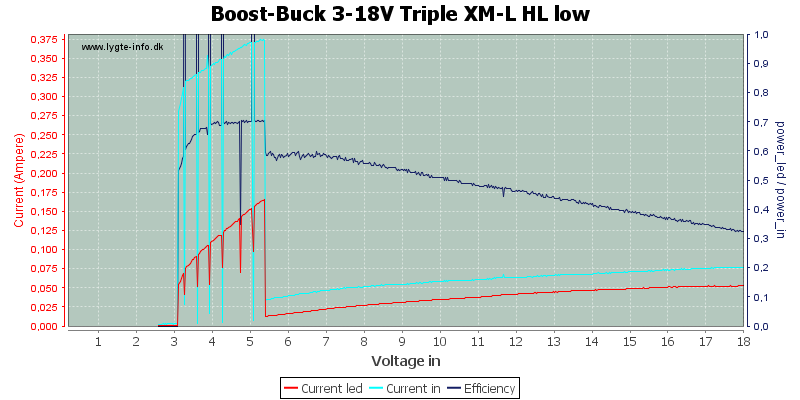 The buck/boost function works very well on this driver, but I am not impressed with the low voltage warning. 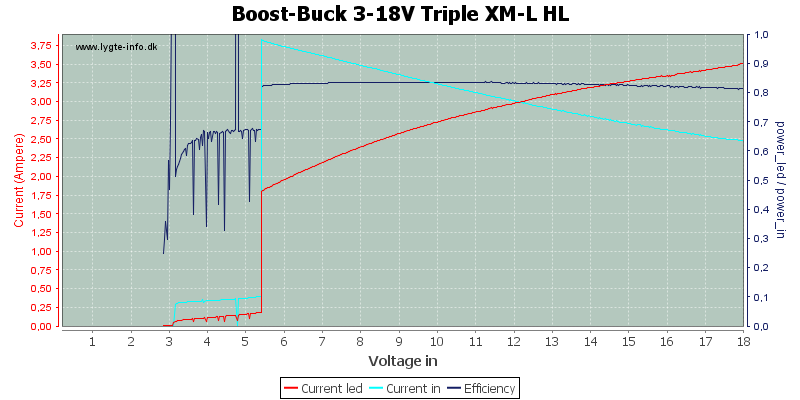 This means it is best to use protected batteries when using 3 or 4 batteries in series.